Of the many pest control methods being used today, roach foggers are one of the most effective and easy to use methods. With such a product, you do not need to hire a professional exterminator to control the cockroach infestation in your premises. When deployed roach foggers will produce a pesticide fog in the target area (Source). This fog will penetrate the cracks and crevices to kill cockroaches and prevent them from coming back. However, not all the available roach foggers are suited for all applications. To choose the right product, you need to consider such aspects as the coverage, safety, type, effectiveness, size and weight of the fogger. As the name suggests, this pesticide fogger produces a concentrated fog and offers a great level of penetration. This being the case, the product is one of the most effective foggers you can buy today. 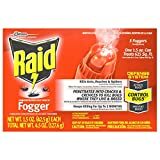 In addition to exterminating the cockroaches in the area of application, the Raid Concentrated Deep Reach Fogger will also control several other pests in your home. 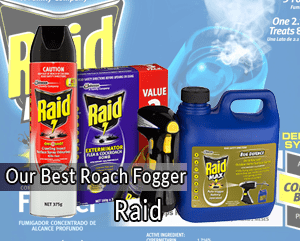 Provided that you applied the fogger properly, Raid fogger will continue killing cockroaches for up to two months. This is achieved using the powerful residue action of the product. With regards to coverage, this product is best suited for a 25’ by 25’ room with an 8’ ceiling. The deep-penetrating fog produced by this fogger will penetrate all the hard to reach points in the room and kill the annoying bugs. Well, not all the roach foggers in the market today are suited for indoor application. With the Spectracide Bug Stop Indoor Fogger5, you only need to fog the space and leave it for about 2 hours. After the 2 hours, the room will be safe both for humans and pets. Another thing you will love about this product is the fact that it is odorless. The product comes with application instructions for deep-penetrating and lasting bug extermination effect. Provided that you use it as instructed, the product will not stain surfaces in your home. Additionally, it has been proven to be safe for use on fabrics, drapes, blinds, shades, furniture, linens, floor tiles, carpets, clothing, bedspreads and upholstery. With regards to effectiveness, the product has been proven to be effective against both crawling and flying insects. The product may be used to control pests in a space measuring about 2,000 cu ft. For safety purposes, it is not advisable to use this fogger in rooms that are smaller than 5’ x 5’. If you have a room smaller than this in your home, it is advisable to let the fog flow in from adjacent rooms. Again, you need to shut off all the pilot lights and gas valves in your home before deploying this fogger. This will reduce the risk of explosion associated with this product. 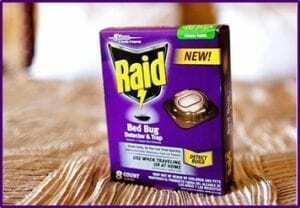 Other than that, you will find the product easy to use and to have a fast action, killing all crawling and flying insects in less than 2 hours. Are you looking for guaranteed results in your new roach fogger? If so, you need to try the Hot Shot Indoor Fogger. In this regard, the product has been proven to continue killing insects for up to 2 months after the initial application. This way, you will not only have an immediate; but also long term pest control in your home. Since the product is designed for indoor application, it features an odor neutralizer design. The product is best used in spaces not larger than 2000 cu feet. This being the case, you will find it effective when used in attics, basements, barns, storage rooms, cabins, campers, boat cabins, garages, households and even in trailers. 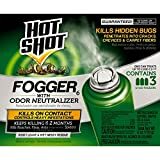 Many fogger users today love this Hot Shot fogger for its versatility, as it offers a comprehensive pest control remedy. In this regard, the product will exterminate such pests as cockroaches, Firebrats, Crickets, Brown Dog Ticks, Fleas, Black Carpet Beetles, Houseflies, Gnats, Mosquitoes, Small Flying Moths and spiders. While some of the best cockroach foggers have a residual effect of about 2 weeks, this product will control roaches in your home for up to 12 weeks. The Black Flag HG-11079 Indoor Fogger is availed in 6 foggers; each weighing 1.25 oz. as compared to similar products in the market, this fogger is one of the best when it comes to controlling German cockroaches. 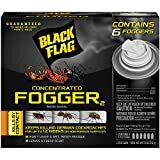 In addition to cockroaches, this fogger has been proven to be effective against several other pests. To be specific, the pesticide has been specifically formulated to kill mosquitoes, houseflies, fleas, ants, spiders, cockroaches, firebrats, silverfish and brown dog ticks. For about $15, you will get 3 foggers of the effective, fast-action TAT 31100 Concentrated pesticide formula. The three 2-ounce foggers you will get offer a decent coverage and may be used to control an array of insects in spaces measuring about 2,000 cu. Feet. Having been designed for indoor pest control application, this fogger features a lemon scented formula. This being the case, you will never experience any irritating odor after using the product in your home. In addition to being subtle on the nose, the product has been proven to kill an array of insects. 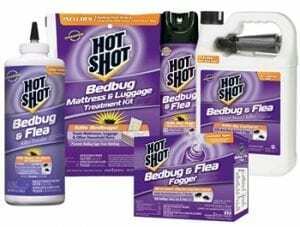 Unlike most of the leading roach fogger brands today, this product has been proven to kill firebrats. Additionally, you will find it effective at killing cockroaches, spiders, ants, silverfish, fleas, brown dog ticks and houseflies. Are you looking for the best way to eradicate a cockroach infestation in your home or are just trying to prevent the nasty insects from getting into your home? Either way, you will find some of the best roach foggers available today a perfect solution. While foggers are a great way to control insects in your home, not all the roach foggers in the market are suited for this work. The choice of the right fogger may seem to be an easy one at first, but it really is not. Not only do you need to ensure that your preferred product is safe for use around humans, you also need to buy one that is best suited for the intended application. These are cockroach foggers that are fitted with a heating element. In their functioning, such units use the heating element to vaporize the pesticide. Such roach foggers are known to produce a thicker cloud of fog. As such, you will be able to see the areas of the house that are covered in the fog and the ones that are not. If this is your preferred type of foggers, you need to choose between the two main types of thermal roach foggers available today. Thermal foggers may be sub-categorized based on the type of element they have. As opposed to the thermal foggers, cold roach foggers do not have a heating element. In their functioning, cold foggers use air pressure to push the insecticide out though a nozzle, hence form a fog. While some of the cold foggers are very versatile, they are not as effective as the thermal ones. Regardless, these products are somewhat effective when it comes to repelling cockroaches and preventing the pests from infesting your home. Again, these products are comparatively cheaper than thermal foggers. A cold fogger will also come in handy if you are not connected to the grid. ULV Roach Foggers – Rather than creating a fog of the pesticide, ULV foggers will foam a mist in the target area. As such, they are best suited for ultra-low volume propulsion pest control systems. Some of the best ULV cold foggers allow you to regulate the rate of flow of the pesticide. Propellant Foggers – These are essentially aerosol canisters that have a large nozzle on top. The preference of these foggers over the other types may be attributed to their affordability. How much space would you like to cover with the roach fogger? You may not be aware yet, but different foggers have a varying level of effectiveness. Additionally, some are great at controlling cockroaches in large spaces, while others only have a limited coverage. You will also need to consider whether you will be using the product indoor or outdoor. The best thermal roach foggers, for instance, are considered to be effective when used to exterminate cockroaches outdoors. Additionally, such units are also some of the best foggers to use in large spaces. In this regard, some of the leading thermal fogger brands are known to have coverage of up to 5,000 square feet. You will find such products ideal for controlling roaches in gardens, backyards or even in campsites. Thermal foggers are considered to be effective when used for such applications because they produce a comparatively thicker pesticide fog. While some of the cold roach foggers available today may be used for outdoor applications, most of them are only ideal for controlling cockroaches indoors. The good thing about some of the cold foggers, especially the ULV roach foggers, is that they allow you to regulate the rate of pesticide flow. Roach foggers/ bombs work by introducing a fog or mist of pesticide into the air. In most of the leading products, this mist penetrates all the cracks and crevices to kill insects by contact. Additionally, the best cockroach foggers also have a residual effect of between 2 and 3 months after the initial application. In addition to getting the best value for your money, you should get a product that is best suited for your intended application. With this guide, you should have an easier time choosing the bets roach fogger.